Plus physical day-one and digital early purchase bonuses. Bandai Namco has released the English version of the second trailer for Girls und Panzer: Dream Tank Match, the Jatkosota High School tanks introduction trailer, and announced physical day-one and digital early purchase bonuses for Southeast Asia (Singapore, Malaysia, Thailand, Philippines, and Indonesia). The “Alice Shimada Oarai Girls Uniform” has been added as an early purchase bonus alongside the previously announced “Rival School Commanders Oarai Girls Uniforms” and “Team Anglerfish Oarai Girls Winter Uniforms.” A product code unlocking the costumes for all 13 girls will be given to users who purchase a physical copy of the game at retail on day one or purchase a digital copy on the PlayStation Store early. 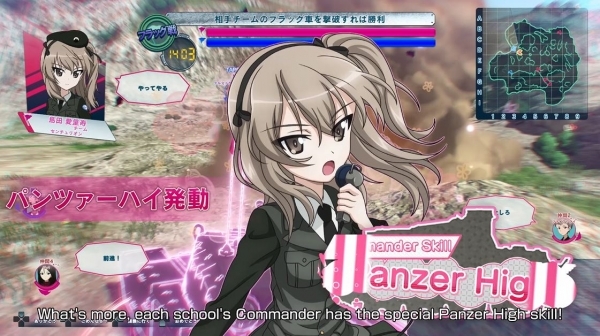 Girls und Panzer: Dream Tank Match is due out for PlayStation 4 on February 22 in Japan, and with English subtitles on February 27 in Southeast Asia (Singapore, Malaysia, Thailand, Philippines, and Indonesia). Watch the trailers below. View a new set of screenshots at the gallery.